When Hulu started showing subtitled episodes of the early 90s Sailor Moon anime about a year ago, I was pretty excited; I wanted something I could watch while knitting that would be entertaining but forgiving if I had to look away from the screen for a moment, and Sailor Moon seemed like a good choice. Despite my deep love of Sailor Moon I had actually only seen most of one season (Sailor Moon S) in the past, back in my senior year of high school, and aside from a couple episodes shown by my college anime club I hadn’t seen any of it since then. I was looking forward to starting from the beginning and working my way up to the part of the show I dimly remembered. And yep, from day one Sailor Moon has been a lot of fun. It can be formulaic and predictable at times, but even when it’s mired in monster-of-the-week-land you’re still looking at monsters like a possessed tennis racquet monster or a priest who turns into a boxing bird-man, and if you can’t find the fun in that I just don’t know what to say. As much as I enjoyed the earlier seasons, I’ve been excitedly waiting until the episodes from S became available. Would I enjoy it as much as I remembered? Would it be yet another thing I retroactively remember as a big flashing Queer Signifier that has gained more significance in hindsight than it ever had in the moment? In hindsight, it’s easy for me to see that Sailor Uranus/Haruka was my first memorable crush on a female character. At the time I don’t know that I would have described my interest that way, despite how clear it is to me now. 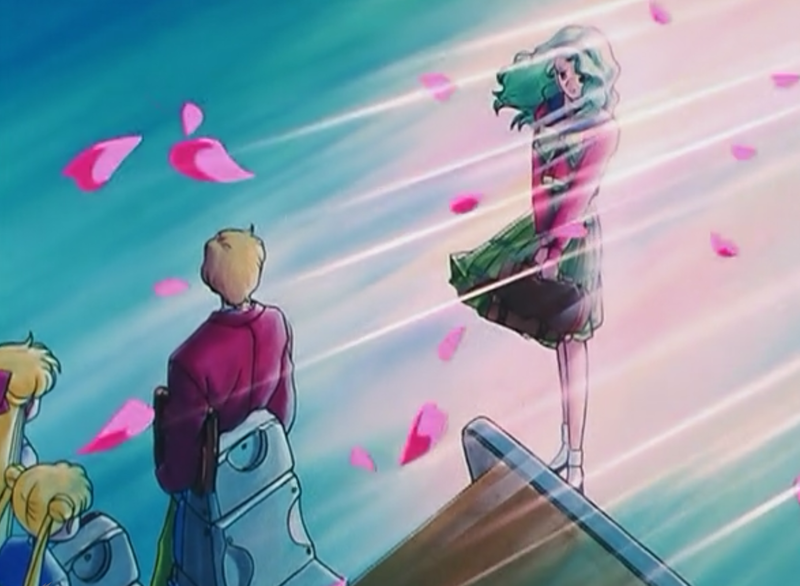 But in the same way I had called my dear friend Tiffany my “forbidden love” in a way that was NOT GAY ok, we just REALLY LOVED each other PLATONICALLY, I was suuuuuper into Haruka and her relationship with Michiru/Sailor Neptune. What I didn’t expect is how the inner Senshi have the exact same reaction to Haruka and Michiru’s appearance that I did. 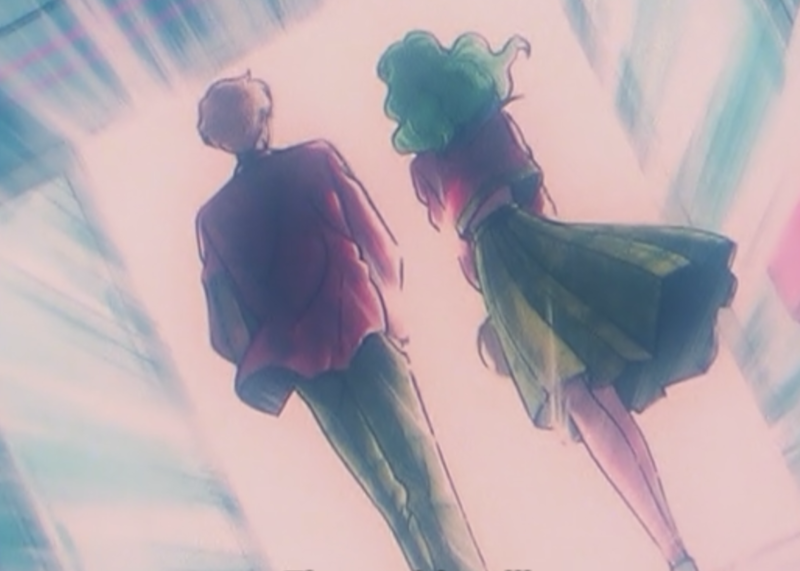 The show itself seems to crush on them; their entrances and exits are often marked by drifting cherry petals and artful sketchy stills, and their intro music is more mature and dramatic-sounding than what the other Senshi get. Usagi and Minako instantly crush on Haruka the moment they see her, thinking she’s a man, and those crushes seem to only sort of disappear once they realize she isn’t. All the Senshi swoon over how great she and Michiru look together even though they seem to struggle a bit with the idea that they might be in a romantic relationship. There’s an episode fairly early in the season in which Makoto seems to have a pretty intense crush on Haruka. She tries to downplay her crush to her friends but is clearly in awe of Haruka and Michiru as they take her out for a drive. Is this purely a platonic crush on someone with a cool style she aspires to? Is it the mix of “want to kiss you” and “want to be you” that I think a lot of queer folks wrestle with in their attractions? It’s not clear to the viewer, or probably to Makoto herself, exactly how she feels about Haruka. What she tells Usagi at the end of the episode is that most of what she’s feeling for Haruka is admiration at how cool she is; she’s mostly focused on her as an aspirational model. Haruka is a woman (she never states she’s a man when Usagi and Minako first meet her; they just make that assumption) but is performing womanhood in a completely different way from what Makoto’s seen before. Earlier in this episode, Makoto tells Usagi she’s worried about ever finding love because she’s large and strong, and tries to play up her feminine pursuits like cooking to compensate. I can see how Haruka would be a reassuring example of a woman who isn’t feminine but is still attractive, competent, and respected – and just plain cool, as everyone’s eager to point out. And that sort of crush (plus the confusion as to whether the exact feelings are admiration, attraction, or both) is very familiar territory for me. When I started to recognize and be open about my feelings for women, it was right when I was also starting to have a lot of gender-angst and confusion. A lot of those early crushes were on women who were experimenting with gender in ways I found inspiring. And to be honest, a lot of my crushes on women now are aspirational; I’m just focusing on very different things now than I did 10-12 years ago. It’s been interesting to see these feelings reflected back at me from these episodes, and it’s made them even more enjoyable than I’d expected. I’m not even halfway through the season, even, so I’m sure there’s more awkward queer nostalgia to come.